Providing adequate and effective lightning protection for storage tanks constitutes a beneficial and cost-effective step in ensuring both personnel safety and operating functional reliability. Fortunately, securing such protection is not difficult or complicated, and guidance is readily available. It helps to become familiar with some basic recommended practices and standards for reference – specifically there will be reference to the National Fire Protection Association (NFPA) 780, ‘Standard for the Installation of Lightning Protection Systems’; the American Petroleum Institute (API) 545, ‘Recommended Practice for Lightning Protection of Aboveground Storage Tanks for Flammable or Combustible Liquids’: and the API 2003, ‘Recommended Practice for Protection Against Ignitions Arising Out of Static, Lighting, and Stray Currents’. When considering lightning protection, it helps to fall back upon three basic steps: bonding and grounding, surge suppression, and structural lightning protection. According to API 545, flat-bottom tanks are inherently self-grounding for lightning protection purposes. The mass of the tank and surface area of its bottom, in contact with whatever material it occupies, provides a sufficiently low-impedance path to conduct lightning currents without increasing the risk of ignition. This applies whether or not a non-conductive containment membrane is in place under the tank. It should be noted that although adequate for lightning grounding, the path to ground may be high resistance, rendering it unsuitable for AC power grounding. In the event of an AC power ground fault, the lack of a low resistance return path may leave the tank energized and a danger to personnel. Therefore, a low resistance ground on the tank perimeter is recommended (at a minimum), and preferable additional grounds so that the distance between grounds does not exceed 100 ft. This usually consists of a conductor attached to a grounding tab at the base of the tank shell, running to a ground rod or to the grounding grid. The major area of concern is, obviously, the floating roof. On an external floating roof tank, there are three lightning events that can cause arcing between the roof and tank shell. The first is a direct strike to the roof itself or its appurtenances. In this case, all of the lightning energy must flow across the seals to the tank shell and to ground. The second is a direct strike to the top of the tank shell. In this case, the lightning energy flows down the shell to ground, and the roof potential must be equalized to that of the tank shell. In the third case, a nearby strike changes the potential for the tanks shell, and much less difference in potential must, be equalized between the roof and tank shell. Lightning energy consists of two components with an intervening transition component. The first is a high energy, short duration surge of energy. The second is a lower energy, longer duration event. The first segment, although conveying high amperage, is so short that it does not normally cause ignition. Think of passing a finger quickly through the flame of a candle. However, the second segment consists of a few hundred amps (roughly equivalent to the electrical service in a home) over 0.5 – 0.75 of a second. When faced with resistance between the floating roof and tank shell, it can easily produce sufficient heat to cause the ignition of any flammable gases present. Therefore, two types of conductors are required between the floating roof and tank shell. The first is a sliding contact between the roof and shell, and is intended to handle the short duration, high energy pulse. This has historically been addressed by the use of shunts between the roof and tank shell. These were developed to overcome the shortcomings on non-conductive seals. However, most modern tanks employ metallic shoes as the primary seal between the roof and shell. These shoes have many times the surface area of shunts. According to wording that was adopted in the 2077 edition of NFPA 780, and which presumably will be adopted in the next revision of API 545, the presence of primary metallic shoe seals negates the requirement for shunts. However, contacts sliding on contaminants produce arcing and sparking, raising the need for a second type of conductor, the bypass conductor. This is a hard electrical connection between the floating roof and tank shell. Because the bypass conductor must be of sufficient length to allow full range of motion of the tank roof, it requires time to become conductive. When it becomes conductive, it quenches any arcing at the sliding contacts, and conducts the long duration, lower energy second segment of the lightning strike. Another area of concern is thief hatches, particularly on production (72 series) tanks. The hatch itself rests on a rubber seal and is connected to its collar by a pin-type hinge. In the field, a high resistance between the thief hatch and its collar has been measured. Lightning current flow across that resistance is capable of producing sufficient heat and arcing to cause ignition. Therefore, a flexible jumper between the hatch and collar should be added to each. The second step in securing adequate protection is surge suppression. Any conductor running to or from a tank is perfectly capable of introducing all types of mischief into the system. A surge suppressor is simply a device that keeps that from happening. Typical conductors found on a tank include AC power for site lights, pumps, valves, etc., and for data collection including levels, temperatures, flow rates, etc. Surge suppressors should be installed at the tank end of such conductors and also at their origin. 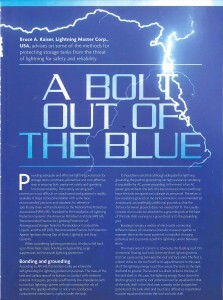 The third step in securing protection is structural lightning protection. When one thinks of structural lightning protection, it is normal to think of lightning rods on the roof of a building. It is important to remember that the purpose of a lightning rod system is to convey lightning energy around a non-conductive structure, such as a house or barn, thereby keeping that structure from burning down. There is no benefit to installing lightning rods on a tank. According to NFPA 780, the tank itself is inherently self-protecting. There are three components that make up a lightning rod system: the lightning rods, conductor system, and grounding system. On a tank, the tank itself is of sufficient thickness to be substituted for the lightning rods, the shell is of an adequate cross section to be substituted as the conductor system, and the site ground is more than adequate for lightning protection purposes. Therefore, the tank is self-protecting without the need to install additional components. Lightning rods would only tend to attract lightning to the tank. There is, however, a technological alternative to conventional lightning rods. These are streamer-delaying air terminals, colloquially known as ‘fuzzyball™’ lightning rods, which are designed to interrupt the lightning completion process by delaying the formation of lightning-completing streamers from objects on the surface of the Earth. A lightning strike begins with the formation of stepped leaders from the base of the storm cloud. These leaders jump in steps of around 150 inches, working their way downward towards the surface of the Earth. When the leaders reach to within approximately 500″ of the surface. Whichever streamer meets a stepped leader first determines what gets hit. As the ground charge builds on a streamer-delaying air terminal, the sharp points break down in to corona under a low potential. When it comes time for a streamer to form from a protected object, the ground charge that would constitute the streamer has been partly dissipated into the atmosphere, thereby reducing the likelihood of a direct strike. NFPA 780 has been used as the design standard for protecting a tank. As the tank contains flammable material, the diameter of the rolling sphere is reduced to 100″ decreasing the spacing between air terminals to just over 12″. They are installed around the perimeter of the tank shell on the foam injection plates and rim, and on the gauging platform. They are also installed on the walkway handrail, if such a handrail is installed. API 2003, Annex C, Direct Stroke Lightning Protection, C1 notes that conventional lightning protection systems do not protect against indirect lightning currents or induced voltages. These are both major causes of ignition, particularly in production tanks. It further notes in C.2.1 that, according to vendor claims, streamer-delaying systems may have some benefit in protecting against indirect lightning currents of induced voltages. This type of performance is obviously preferable. In the real world, ,there has been a high success rate with operators installing this type of system. Indeed, the cost has been justified in both actual savings associated with extinguishing a fire, reducing lost time in service, and in preventing injury and death. 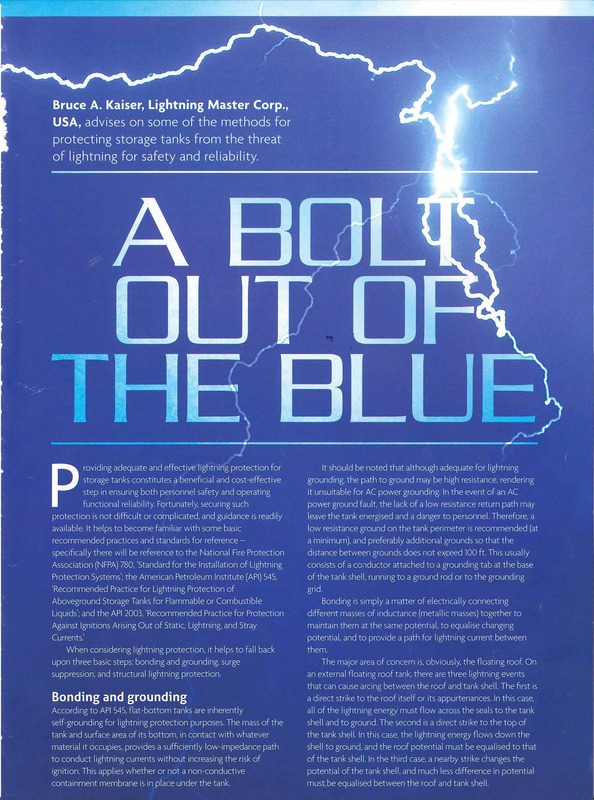 Author: Bruce A. Kaiser, Lighting Master Corp., USA, advises on some of the methods for protecting storage tanks from the threat of lightning for safety and reliability. Bruce serves as a principle member and contributor of writing the standards for NFPA 780; API 545; API 2003.